Here are some pictures of the Edinburgh Demo against Israel last saturday featuring the Dundee crowd… It was a Dundee show all the way… take a look.. 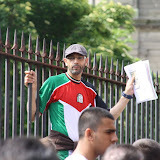 This entry was posted in Boycott Israel, Campaign, Dundee, Edinburgh, Events and tagged 5th June, Demo, flotilla, freedom, Gaza, Palestine, protest. Bookmark the permalink.